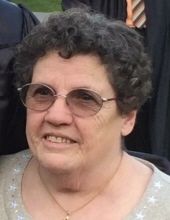 Jane Wilson, 80, of Franklin, passed away at 12:30 p.m. on Saturday, April 13, 2019 at UPMC Hamot in Erie following an illness. Born December 5, 1938 in Franklin, Jane was the daughter of the late George and Eva Lough Hovis. She was a graduate of Rocky Grove High School. She worked at Franklin Hospital as a Secretary for 15 years, and retired from Blair Call Center where she worked as a Customer Service Representative. On December 5, 1956, Jane married her sweetheart and love of her life, Ronald Wilson, and began a wonderful family together. He preceded her in death on February 18, 2019. Jane enjoyed playing cards and bingo, and making crafts. She was a collector of "elephants" of all shapes and sizes and had more than 100 in her collection. She was an avid sports fan, and especially enjoyed watching the Pittsburgh Steelers and Pittsburgh Pirates. Jane also enjoyed sitting on her porch in her 'Steelers' porch swing. She especially cherished her family and the times she spent with them. Jane is survived by her 5 daughters, Rhonda Wilson of Franklin, Pamela Latchaw and her husband, Jeff, of Shelby, NC, Cindy Green and her husband, Lloyd, of Franklin, Carrie Pedersen and her husband, Jeff, of Conneaut Lake, and Melinda Gannoe and her husband, Ron, of Cooperstown; and her son, Steve Wilson and his wife, Carol, of Franklin. She is further survived by her 14 grandchildren, Jason Milner, Joe Latchaw, Penny Willyoung, Peggy Latchaw, Rebecca Schleifer, Stephanie Viele, Samantha Wilson, Lacey Graziano, Jerry Fleming, Andrea Fleming, Ian Kuivinen, LaRae Kuivinen, Tyler Gannoe, and Garrett Gannoe; and her 12 great-grandchildren. In addition to her parents and husband, Jane was preceded in death by her infant daughter, Virginia Wilson; her 6 brothers, Jack, Bill, Bob, Fred, Jim and Chuck Hovis; and her 2 sisters, Betty Sutley and Dot Dupont. As per the family's request services are private and a Celebration of Life will be held at a later date at the convenience of Jane's family. In lieu of flowers, the family suggests that memorial contributions be made to the Venango County Humane Society, 286 South Main Street, Seneca, PA 16346. To send flowers or a remembrance gift to the family of Jane Wilson, please visit our Tribute Store. "Email Address" would like to share the life celebration of Jane Wilson. Click on the "link" to go to share a favorite memory or leave a condolence message for the family.